Costa Rica is full of canopy tours and rivers perfect for exciting whitewater-rafting expeditions, but golf players can also find a golf paradise along this beautiful country. 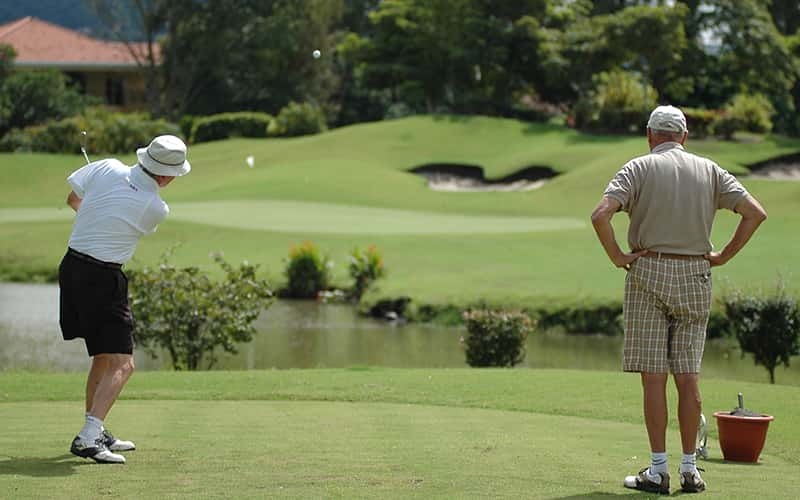 No matter if you are a beginner or an expert golf player with lot of skills, Costa Rica's golf courses will offer you a golfing experience you will never forget! The country has established itself as a world-class golf destination with particular rewards like the natural beauty that surrounds its golf greens. Famous golf course architects such as Arnold Palmer, Robert Trent Jones and George Fazio have incorporated Costa Rica's rich and diverse natural settings into remarkable layouts. 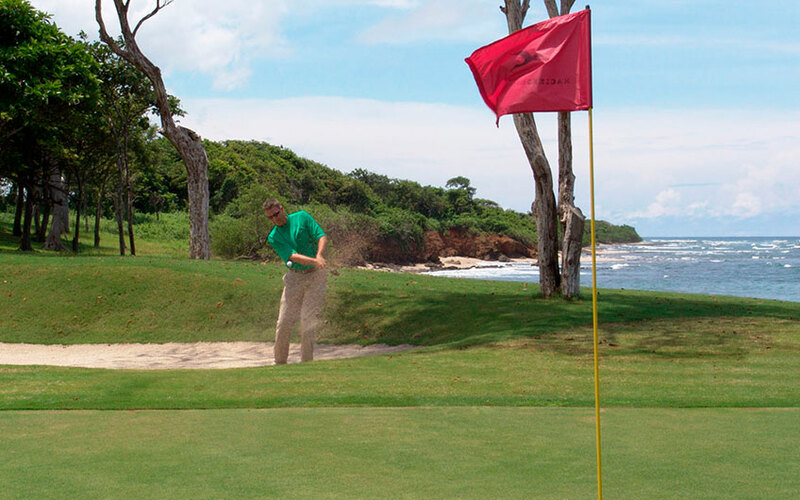 There are golf courses next to tropical rainforests, while others have panoramic views of pristine Costa Rica beaches. In fact, it's not unusual for golfers to encounter spectacular birdlife which allows a great birdwatching experience, and wildlife such as monkeys and iguanas. 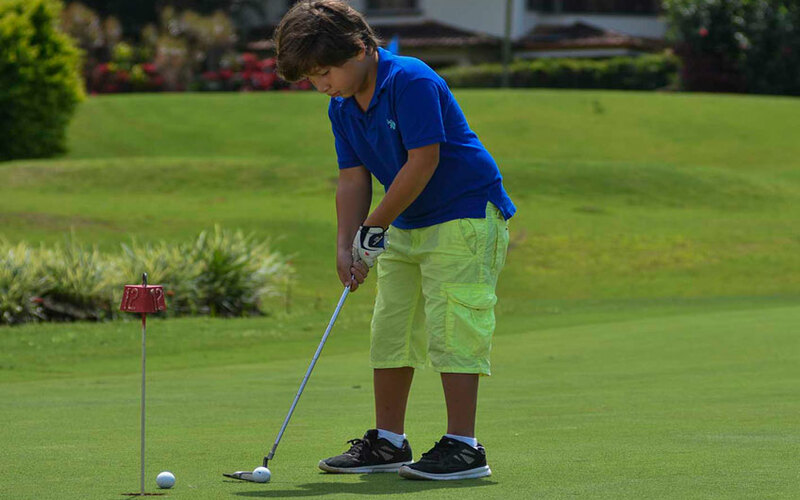 Also, one of the best things of making a Costa Rica travel to play golf, is that golfer's families can choose from a lot of fun activities to do thanks to the amazing weather and day tours the country offers. Travel Excellence has two vacation packages combining the best golf greens and some luxury hotels that will allow you to spend some unforgettable golf vacations: Costa Rica Golf Experience, a package that combines the golf courts located in the Central Valley and the Central Pacific landscapes; and Golf in Los Sueños, an itinerary that instead of Guanacaste offers the option of visiting the Central Pacific region of Costa Rica. Location: Located in the Central Valley, at approximately 5 minutes driving from Juan Santamaria International Airport. 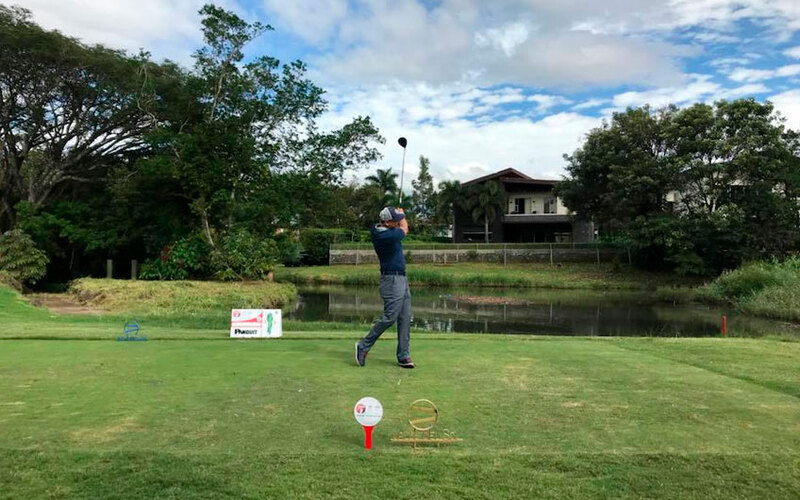 The Cariari Country Club is the perfect place to play when visiting Costa Rica, and with proper planning, it is a great way to end your holidays in Costa Rica as well. This private golf club, founded in 1973, was designed and built by golf course architect George Fazio on a land that was once a coffee plantation. This par 71 course measures 6,590 yards from the Championship tees but plays much longer. The course is heavily wooded; the fairways are narrow with few fairway bunkers, and the greens lean toward the large side with sand traps throughout. The fairways are seeded with Bermuda 419 and the greens with Bermuda 328. Please note that there is mandatory use of caddie at this course. Location: Located in San Jose Costa Rica at 20 minutes approximately from the Juan Santamaria International Airport. The Valle del Sol Golf course was the first course open to the public in the capital city area. With 7.011 yards, this par 72 championship style course offers ample fairways surrounded by majestic trees and large lakes that attract diverse and lively wildlife, where more than 20 different bird species can be observed. They are proud to be certified by Audubon International, the most acknowledged ecological program in the world of Golf. Mrs. May, with the assistance of the on-site construction supervisor Mr. Mark Dinan, has designed the layout to be challenging and fair under most conditions, and downright tough when the winds come swirling down from the surrounding mountains. The layout is diverse and requires the use of all the clubs in your bag. Valle del Sol was designed with five tee boxes that allow the weekend golfer and low handicapper have a great time. The rolling hills, mature trees that were part of the original course and the surrounding mountains create a great setting for some Costa Rica golf. Location: Located in the Northern Pacific side of the country, in the Guanacaste area, at a driving distance of 40 minutes approximately from Daniel Oduber International Airport. Reserva Conchal Golf Course is part of the Westin Golf Resort & Spa Playa Conchal, a truly memorable golfing experience, designed in the classic tradition of the game by Robert Trent Jones II. It was the first Audubon-certified golf course in Costa Rica. This 71-par championship course provides players with both a challenging and an extraordinary eco-golf experience. Lakes and ravines accentuate the course and put a premium on tee shots and accurate approach shots to large, manicured Bermuda-grass greens. Location: Located in the Northern Pacific, in the province of Guanacaste, at approximately 40 minutes from Daniel Oduber International Airport. This 7,300-yard, par 72 masterpiece golf course is the creation of Mike Young, who is responsible for some of the finest courses in the southern United States. At Hacienda Pinilla, you'll see a shining example of Young's passion for the game, respect for tradition, concern for the environment and sharp eye for detail. Each hole was designed to conform to the slopes and contours of the natural landscape. Not only has he met the highest standards required by international golf organizations in building the course, but recently the property earned certification as an Audubon Cooperative Sanctuary for its preservation of the ecological balance of the area. The course is a coastal layout with wide, open fairways and the prevailing winds come into play on just about every hole. The bump and run are recommended for most approach shots as the greens are hard and fast. A truly distinguishing characteristic of Hacienda Pinilla is the many well-placed pot bunkers that are cleverly placed around most greens. The course offers a lot of variety. It is challenging and will reward conservative play more often than not. Location: Located in the Central Pacific coast of Costa Rica, at 1 hour and 15 minutes approximately from Juan Santamaria International Airport. 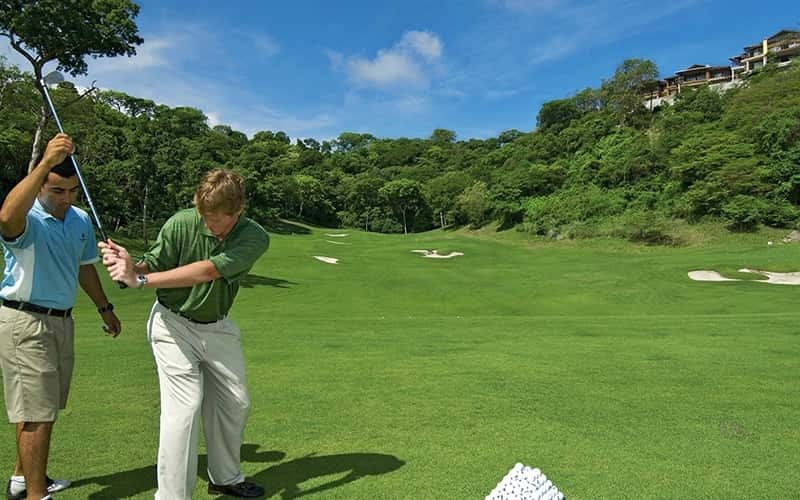 La Iguana Golf Course is an amazing 18-hole championship golf course (course rating: 73.4, par 72, slope 145). 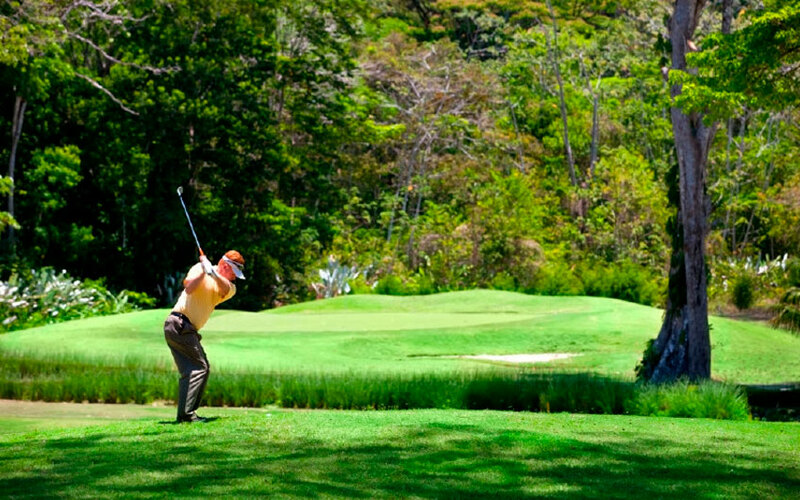 Designed by Ted Robinson, this championship golf course is considered to be naturally challenging as golfers play through the wilds of the Costa Rican jungle. Mr. Robinson has designed a course that few in the world can match for natural beauty and challenging golf. 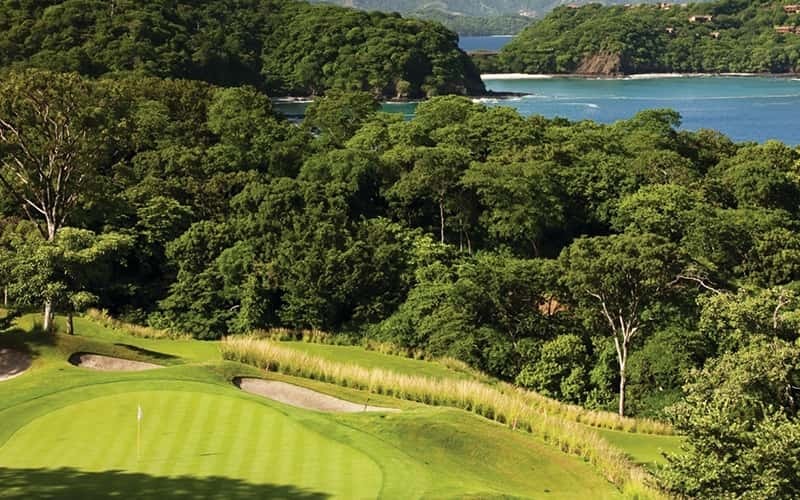 It is not uncommon for guests of Los Sueños Marriott to wrest their eyes away from the challenge of the golf course and just gaze up at one of the most picturesque settings on earth, a dense canopy of exotic plants, trees, and wildlife. Your golf guides will be happy to point out friendly monkeys and brightly hued macaws. But make no mistake; the mesmerizing scenery masks a challenging course-one well worth conquering. Location: Located in the Northern Pacific area, in Guanacaste, at 45 minutes approximately from Daniel Oduber International Airport. Designed by one of the greatest players in the history of men's professional golf Arnold Palmer, the 18-hole, par 72 golf course of Four Seasons Resort Costa Rica is certified by the Audubon Cooperative Sanctuary program. This program provides information and excellence to help golf courses preserve and enhance wildlife habitat and protect national resources. The course, not only set amid crystalline waters but also deep green forests, has labeled important trees turning the cart path into a botanical garden. Hole to hole, the course offers a chance to see and appreciate a diversity of colorful plants, trees, birds and animal species. The Congo (howler) and Capuchin (white-faced) monkeys are among visitors' favorites. Check our Costa Rica golf map in order to know better where you can enjoy this sport during your Costa Rica vacations.